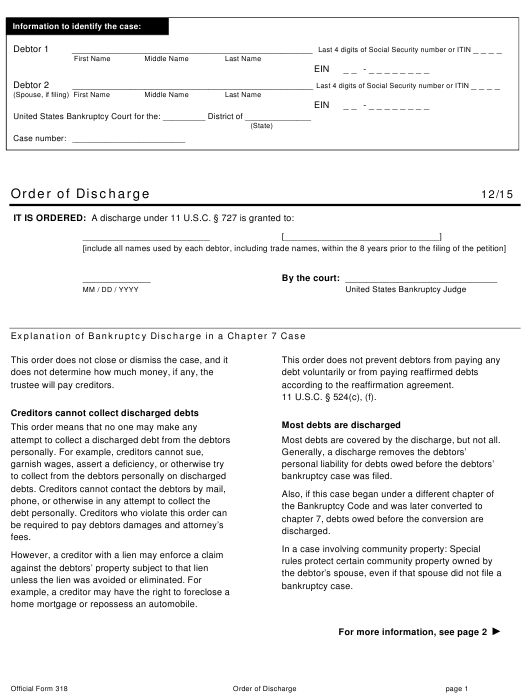 Form 318 or the "Order Of Discharge" is a form issued by the United States Courts. Download a PDF version of the latest Form 318 down below or find it on the United States Courts Forms website. according to the reaffirmation agreement. 11 U.S.C. § 524(c), (f). Most debts are covered by the discharge, but not all. home mortgage or repossess an automobile. person who cosigned or guaranteed a loan. exact effect of the discharge in this case. operating a vehicle while intoxicated.